This is the second installment in my “State of Chicago” series. Last time I looked at Chicago’s 70s and early 80s horrible struggles followed by rebirth and robust out-performance during the 1990s. Today we turn our attention to the first decade of the 21st century. During the 2000s, Chicago experienced a bit of a two-track performance. Parts of the urban core continued to grow robustly, fueled by the real estate bubble and perhaps the greatest urban condo building boom in America. The culinary, cultural, and other scenes in Chicago only improved. Yet while there was a solid core of health at the center, the overall city and region stumbled badly with aggregate statistics that were, bluntly, awful in most respects. I’ve detailed these elsewhere already so won’t go in depth, but let’s review. These are metro area statistics unless otherwise noted. I already discussed how Chicago got shellacked in the 2010 Census. It was the only one of the 15 largest municipalities in the United States as of 2010 to lose population. The cities of New York, Los Angeles, and San Francisco hit all time record high populations. 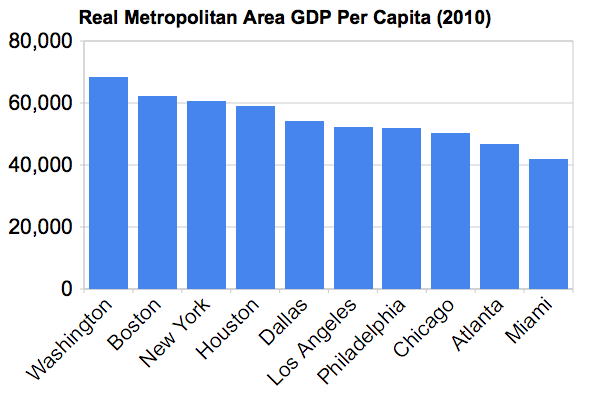 Philadelphia and DC grew for the first time since 1950, and Boston continued growing. But Chicago has now rolled back its population clock a hundred years and stands at its lowest population since 1910. Chicago’s metro population growth of 4% was less than half the national average, and virtually all of that came at the exurban fringe. Chicagoland ranked 40 out of 51 large metros for population growth, though it did beat New York, LA, and Boston on a regional basis, which is positive. This previous data was all from previous writings. I want to highlight a couple of other areas of demographic weakness though. First is international population. Chicago’s percentage of foreign born residents is 17.6%, which beats the national average, but trails New York and LA by over ten percentage points. It ranked 5 out of the 10 largest US metros. On a growth basis in foreign born population, Chicago did beat New York and LA. Those three were at the bottom in the percentage growth category, most likely because they all started from relatively high bases of total foreign born population. On a total change basis Chicago ranked 7th, with New York #1, but sick man LA brought up the bottom, a stunning change of fortunes for them. The city of Chicago itself seems to have lost its allure to immigrants. The foreign born population of the city actually declined during the 2000s. Even during a decade of huge Hispanic population growth nationally, Chicago barely grew its Hispanic population. The city of Indianapolis, about a third of Chicago’s size, added nearly twice as many total Hispanic residents. To the extent that immigrants now see Chicago as an opportunity zone, it appears to be suburban Chicago. 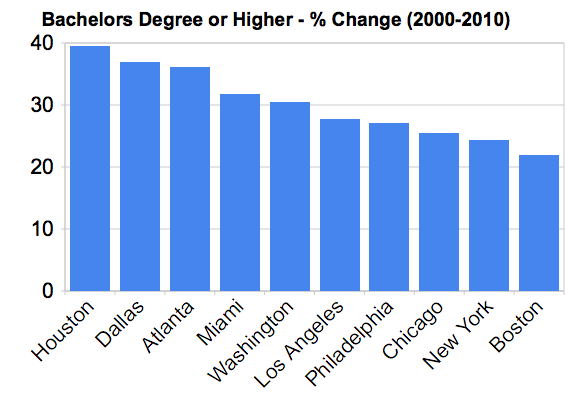 Chicago’s college degree attainment is in the middle of the pack for the top 10, ranking #5. Considering it came from an industrial heritage, I think this is pretty good. 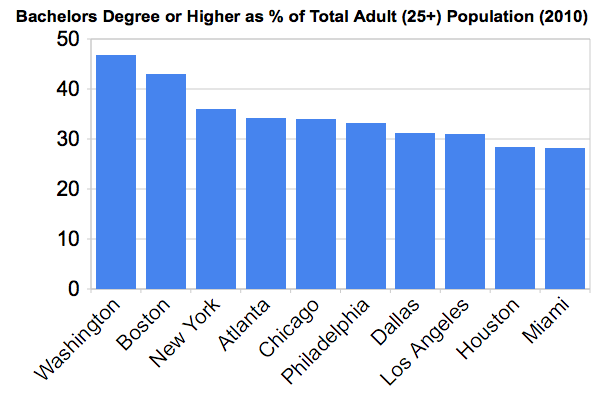 However, Chicago only ranked 8th out of the top 10 in the growth in population with bachelor’s degrees. This hardly suggests that metro Chicago is a talent magnet. If you look at the numbers vs. other large Midwest metros, Chicago is healthy, but not looking like it is pulling away from the pack. I don’t see anything to suggest that Chicago is hoovering up all the college grads in the Midwest. – This figure is for the Loop, not the Central Area (a bigger construct). The Loop does have the majority of the Central Area jobs, however. – Much of the construction was residential, not commercial. Also, things like the booming Loop U probably brought in more students than jobs. – Keep in mind that 2000 was the peak of the dotcom bubble. For reasons I’ll explore later, I believe this hurt Chicago badly. 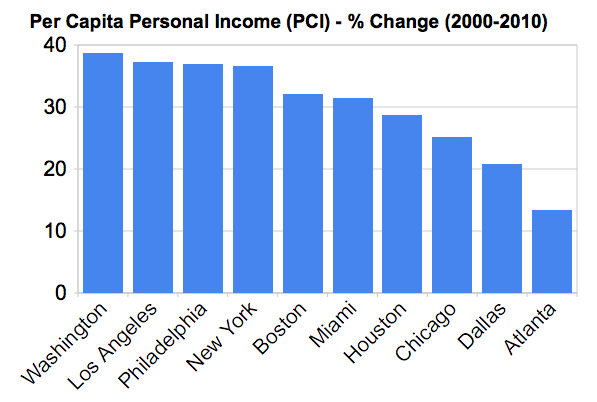 So there’s a tough comp (also why the Bay Area and to a lesser extent Boston look bad on comps vs 2000). – Consider major Chicago companies that totally went out of business: Arthur Andersen and Whitman-Hart come to mind. – Also consider that pledges of added jobs generally are trumpeted to the sky, while jobs are often cut silently as much as possible. Chicago also ranked eighth in real per capita GDP growth over the decade. On the whole, this is a rather uninspiring collection of economic statistics for the Windy City, particularly after it did so well in the 1990s. No discussion of Chicago’s problems in the 2000s would be complete without a review of its fiscal problems. However, as I already gave the numbers in my City Journal article, I won’t repeat them here. If anything, the problem has only gotten worse since that went to press. While Chicago may not be the worst municipality in terms of fiscal issues, Illinois is the worst state, and that will continue to be a drag until it’s addressed. Among the biggest complaints about my article was that I didn’t address the crime problem in Chicago. Without a doubt, crime is a problem. Murders are up 38% or so just in 2012. The city of Chicago has a much higher murder rate than the cities of New York or Los Angeles. There has also been a national headline grabbing series of high profile attacks in affluent areas like the Gold Coast and Streeterville. The strength of the Chicago Police Department is somewhere between 500-1000 officers short of where it should be. I’m not the best equipped person to talk about crime, but I actually think the crime problem is overstated. Yes, it’s serious. The murder rate especially is troubling. But analyses I’ve read suggest that overall crime isn’t spiraling out of control in Chicago. Also, flash mob type attacks are happening across the country, in places ranging from Philadelphia to Portland. This isn’t a unique to Chicago situation. So I don’t want to claim that Chicago’s crime problems are uniquely bad, though they shouldn’t be minimized. Without a doubt the incredible collapse in crime in New York perhaps more than any other single factor fueled that city’s comeback, and it wouldn’t surprise me if it were a big factor in that city’s out performance in the 2000s. Mark Bergen cited some interesting research that suggested that for every murder in your city, 70 people move out. If Chicago had matched New York’s crime performance, it would have held steady or even gained population based on this relationship. If true, wow. Regardless, public safety is job #1 for any mayor, so Rahm Emanuel is rightly feeling the heat on this even if he can’t necessarily be blamed for what’s going on. Others have cited Chicago’s poor public school system. Again, I’m not sure Chicago’s schools are any worse than any other big city system, and there are a number of magnet and neighborhood schools that are now attracting the children of the well-off. I’d have to see something that suggested Chicago took a turn for the worse on schools in the 2000s on a comparative basis. There are more statistics that could be given, and if you want them, I suggest reading the very data rich OECD Territorial Review of Chicago. On the whole I think it’s pretty clear that there was trouble in Chicago during the 2000s – and more trouble than most large cities experienced during what was a tough decade nationally. Some rightly noted that I discuss the divergent performance of Chicago in the 1990s vs the 2000s, but that my structural factors that weaken Chicago were probably the same in both decades. So why the difference? I want people to know I plan to address that in a future post shortly, but next up we’ll have a look at Chicago’s present day strengths before moving on. If you think crime is overstated I beg to disagree. It is now 5:31pm. I work from home and was walking down my alley to grab a hotdog. My neighbor walks up to me and says another kid was shot dead approximately 2 hours ago. This is the second killing within a 1 block radius in 2 days. Now, within the last 7 days we’ve had 3 or 4 more killings within 2 blocks of my house. I’ve been in this neighborhood for approximately 5 years and I’ve maybe had 2 or 3 shootings in that time…in my immediate area. I can only imagine how Chicago would look if the crime didn’t exist. There was a study done a couple weeks ago that said Chicago loses 5.4 billion dollars per year due to violence (pretty sure that was the number). I live on the Westside between two major public transportation hubs. I’m an 8 minute drive away to the Loop. If this location was virtually crime free, this place would be full of entrepreneurs, start-ups, small businesses and young talent such as neighborhoods like Logan Square and West Town. Take my word for it…crime is stunting the city’s growth tremendously. If the Garfield Park neighborhood were gang and drug free, this place would have the population of a small to mid-size city. But with gang-bangers and drug dealers occupying almost every single corner on the westside, nothing will change and people will continue to leave the city or not come at all. And one more thing…crime has no boundaries and crime travels. All Chicagoans should be concerned. Aaron just to clarify Indianapolis is more like 1/5th the size of Indianapolis. The metro area of Indy is around 2M people and Chicago is 10M people. The city proper population shouldnt be the only stat to look at. Even so Indianapolis gained 15-20% population growth as a metro well as you said Chicago was only a dismal 4%. I believe were hitting the climax of the big american cities and seeing a shift to smaller and more affordable cities like Indy and Austin etc. Heck an article today pointed to how jobs in the financial sector are leaving New York City due to how expensive it is there. Evan, I’m sure Aaron realizes that metro chicago is many times larger. I think he is comparing municipality to municipality. Maybe that was easier or more reliable data than looking at the larger metros. Re. “the greatest urban condo boom in America”, there’s no way Chicago would hold this title. I think that Chicago’s 2000-2008 condo boom is wildly overstated because so much of it was in a very small geography (basically South Loop to North Ave.), and so much of it consisted of large, prominent, flashy towers above huge garage bases. Outside of that geography, there was comparatively little condo development, and even the condos in that area don’t have as many units as one may assume. Keep in mind that all these buildings have huge parking garages. Some buildings are roughly 50% parking garage. 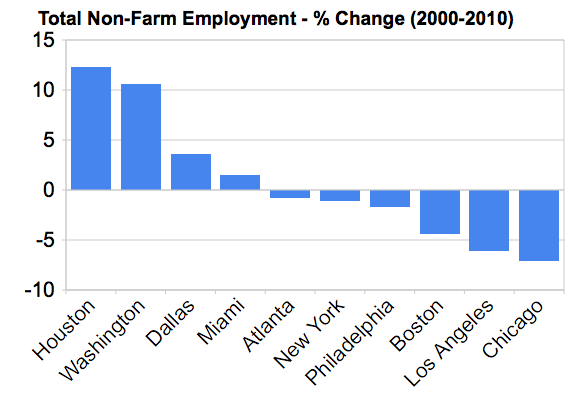 In terms of % growth, Miami was the clear “winner” during this time period. In terms of number of units, NYC was the clear “winner”. Miami, of course, built tens of thousands of units (far more than Chicago in number, and obviously, by %). NYC built roughly 30,000 units annually, about three times the annual growth of Chicago. The big difference with Chicago is that, in NYC, the condos were built everywhere. In fact, nearly 75% of the new housing units were built outside of Manhattan. @BelmontRes, it’s possible that Miami or New York built more, but your geography is way off. You are only talking about the high rise zone, but enormous swaths of the city were covered in low rise condos. Developers would whack an old wood frame two-flat and erect a three condo replacement, for example. @Evan, you are right about metro vs. city, but that comparison was used in a paragraph whose point was about the city of Chicago losing attractiveness to immigrants. Hence the comparison vs. the city of Indianapolis. Chicago’s population would increase at a much faster pace if there were elimination of height and minimum setback restrictions, require ground floors of infill buildings used for retail, decrease impact fees to 0 for infill buildings, increase impact fees for low-density land use, and base property taxes primarily on the value of the land rather than the value of the building. This would also generate more local jobs (due to a shift in proportion of the cost of buildings and transportation from imported material and energy toward local jobs). Education would improve because there would be greater education property tax revenue per square foot of land and the average journey distance to school would be less. Combined with more pedestrians on the street, there would be a reduction in the crime rate. When looking at crime in Chicago one also has to look at race and public housing. The high crime areas are also areas of massive HUD presence in the form of section 8 vouchers and / or new public housing townhomes built to replace the towers that came down. Although architecturally different, the new “New Urbanist” complexes are still a concentration of the poor in areas far removed from the job creating centers like the manufacturing districts in the suburbs. The residents are overwhelmingly black and isolated with disenchantment festering among the young male population. Although this dynamic isnt new, it is entering a new phase as the 4th and 5th generations of southern transplanted blacks who didnt make it in the north find themselves lower than ever on the economic ladder. From a policy standpoint we need to ask, ” have we failed these people / Should we continue to throw money we dont have at this social problem”? By keeping the black population isolated in government funded housing, we are directly spending huge sums of money in housing and social programs, losing tax revenues because the neighborhoods become so bad it drives out tax producing citizens and then metastasizing the problem as crime and gangs spread to nice areas of town driving even more people away. Chicago has a race problem, no doubt but its not that Chicagoans are inherently racist. We’ve simply been overwhelmed by policy decisions from the Federal level that have destroyed a good 1/3 of our once vibrant city over the last 40 years. Urbanists point to the 180,000 person decline in the black population as a bad thing – I’d argue its a good start to fixing what ails Chicago. We need to lose a couple hundred thousand more. It’s all part of the “Plan for Transformation”. CHA is intentionally not filling vacant units. The CHA also needs to go. Its really a big money grab for connected insiders. In many ways, the original black belt was far better for people who lived there and the city and culture. Yes 43rd and State was overcrowded and run down but the residents had opportunities to start small stores, own a business and there existed a cultural hurricane in the blues and jazz, literature and poetry. The urban renewal schemes killed all that. Cities and populations want to evolve naturally and chaotically, top heavy planning retards that growth. Arron’s whole analysis is based on guesses and sometimes he guesses right and other times he guesses wrong. That makes his articles pretty much worthless for me. He also stretches and manupilates data to favor his arguments. Anyway, Chicago did not have the largest condo boom by a long shot. I’m sure NYC and Miami had a bigger boom. And the poster who said Chicago’s condo boom only happened from the South Loop to North Ave, clearly has no clue what he’s talking about. Yes, the high rise condo boom took place within the boundary he mentioned but many other parts of the city experienced a condo boom. Even southside neighborhoods such as Englewood, Woodlawn and Bronzeville experienced a mini boom through conversions and new construction. Even now, people would probably think there’s no condo’s being built in the city since there isn’t any being built downtown but there are in fact many small condo developments going on throughout the city. On the condo boom comment, I did say “perhaps” indicating that I was speculating. So yes, I guess you could say that was a guess 🙂 And I admit off the top that I’m not the best commentator on crime or education issues. But the vast bulk of the information in this article is solid demographic and economic statistics from gold standard sources. They are consistent with the OECD and World Business Chicago reports that recently came out. If there’s a particular stat you think is “twisted” I’d be happy to take a look at your criticisms. Aaron,I disagree re. the condos. I think your views are skewed perhaps by where you lived and interacted. Yes, certain Chicago neighborhoods had infill development, but definitely not an “enormous swath” of the city. Outside of the core highrise areas, the only parts of Chicago that had extensive infill development were West Lincoln Park, West Lakeview, and that whole Lincoln corridor up through North Center, and then, to the west, Wicker Park/Bucktown/Ukranian Village. This is in strong contrast to NYC, where 75% of housing units were built outside of the core, the vast majority in non-yuppie neighborhoods. Places like Brighton Beach, Rego Park, Flushing, and Sheepshead Bay were the condo leaders most years. Heck, even East NY built a couple thousand units. The religious Jewish areas (South Williamsburg, South Crown Heights, Borough Park, Midwood, Kew Garden Hills, Far Rockaway) also had very strong growth. The yuppie areas (Manhattan, Brownstone Brooklyn, Western Queens) weren’t really the main drivers of housing unit growth. They added new housing too, but not really beyond their relative share of the population. In Chicago, 10% of the city had 90% of the housing unit growth. In NYC, the housing unit growth was very roughly evenly distributed across the Five Boroughs. 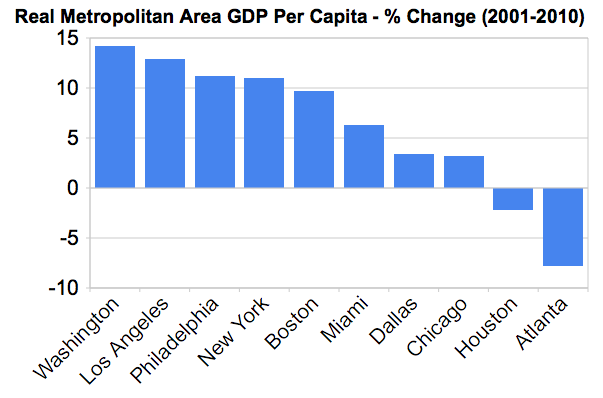 This is why it seemed like Chicago had a big boom, even if the per-capita housing unit growth was less than in NYC. I don’t understand how the Loop could have lost that many jobs while the overall Loop office vacancy rate right now is 14.8% according to Crains. Doesn’t make sense. 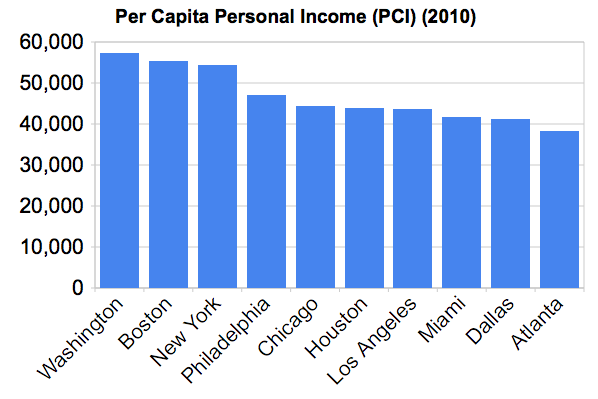 Those graphs seem to validate my perception that Chicago and Philadelphia are sort of kindred spirits. Economically and demographically, they’re pretty similar. They’re both similarly wealthy and educated, and the fact that they appear right next to each other on the income/GDP per capita and the college attainment graphs illustrates this. In terms of racial/ethnic diversity, trade a few blacks in Philadelphia for a few Hispanics and it’d be identical to Chicago. They both have nagging problems with crime and poverty, and while there’s an increasing amount of wealth and gentrification in each city, there are still some neighborhoods that are almost uninhabitable. Crime and taxes prevent each city from being all they can be. They both face challenges at the state level, with Illinois being insolvent, Pennsylvania being dominated by rural pastoralism, and both states having well-documented instances of corruption. They both have inferiority complexes when compared to other cities: Chicago with the other two XXL cities, and Philadelphia with its East Coast siblings. Neither gets much attention at the national level relative to their size, and both get bypassed too often by tourists, Chicago by plane and Philadelphia by car. I know there are some differences between each city, but the similarities seem to be numerous enough to make their plight similar. There were a lot more areas with SFH and Condo constuction, Rogers Park, Uptown, Edgewater, Albany Park, Bridgeport, Avondale, Irving Park. Peter, I agree that all of those neighbors added housing units. But that isn’t really my argument. I’m talking about completely transformed neighborhoods, such as parts of Bucktown, West Lincoln Park and the like. There aren’t many non-core Chicago neighborhoods where the blocks are completely unrecognizable from 10 years ago. This is in strong contrast to NYC, where many non-core residential blocks were basically demolished and rebuilt. Imagine if random bungalow neighborhoods near Midway airport or the Indiana state line were suddenly caught up in a frenzy of rebuilding. That’s what I’m talking about. You see this in the outer NYC neighborhoods like Spring Creek (Brooklyn-Queens border), Mill Basin (Brooklyn) or really any Orthodox/Hasidic neighborhood. Got it BelmontRes, that makes sense. I would argue, however, that 2010 is already old news. Chicago has a LOT more to do, for sure. But already things are getting better. 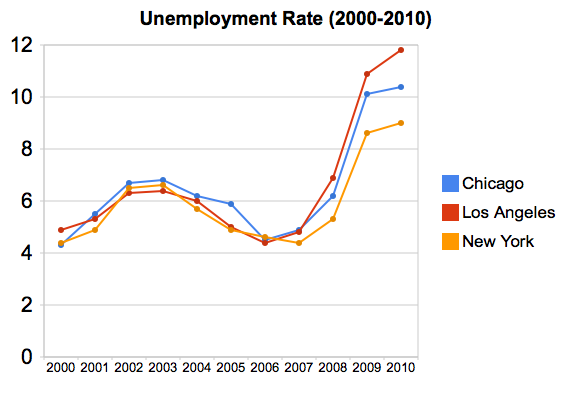 As I’ve mentioned before, metro Chicago’s unemployment rate last month closed the gap and is actually lower than NY’s. In addition, population gains were seen in the city, office vacancies have seen 8 straight months of decline, and many companies continue to flock downtown. The apartment sector is booming, hotel occupancy was 92% in June (according to Crains), and Rahm is investing more in the city’s “meat and potatoes” infrastructure than his predecessor seemed to do. Congress just passed a Transportation Bill that will finally pour money into local road and transitways, O’Hare expansion continues, and Rahm is now allowing food trucks to prepare their own meals! If Illinois could address the pensions, the unions, and if we could finally clear out all these distressed properties, we may finally start seeing Chicago make real forward progress. I think we will, but we’re a few years away. I’ve noticed an interesting phenom recently in some in the Household Employment Survey vs. the payroll survey for NYC, LA and Chicago in May 2011 vs May 2012. Those seem like strange numbers, does anyone know what might be behind that?